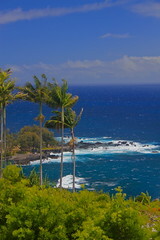 We decided to move to Kona on the Big Island of Hawaii. It took us a month and a half after deciding to move to pull the trigger. Everything had been falling into place and pointing us there except the money part. And while the money part wasn’t solved, we were both ready to take the leap and make it happen. It feels right. Like a giant magnet is pulling me… us… there. It also feels monumental – instead of talking about our dreams and wishing for things, we’re really taking life by the horns and making things happen. So PHEW! After months of talking about Hawaii and YEARS of talking about a potential move, we FINALLY picked a destination! One we’re both crazy excited about. Next post: Wow, Just Wow! Previous post: Where to Go, Where to Go. . .